The Kiefer Foundation in Plymouth, which trains and educates teenage drivers and their parents about the importance of safe and responsible driving, Wednesday announced the second phase of a project with the Michigan Department of Transportation to install a 1.3-mile stretch of protective cable guardrail on I-96 near East Lansing. Wednesday’s press conference at the Detroit Police Department headquarters also commemorated Mitchel Kiefer, the son of Steven Kiefer, senior vice president of global purchasing and supply chain at General Motors Co. in Detroit, who was killed in a distracted driving accident on Sept. 19, 2016 while on his way back to Michigan State University. “Not one day goes by that we don’t think of Mitchel,” says Kiefer, chairman of The Kiefer Foundation. “Being without him will never get easier, but we find comfort in changing the world in Mitchel’s name. (It was) the worst day of our lives. The worst day of any father’s life. I recall a frantic phone call from my young daughter, Julianna, who was with (Mitchel’s mom), Paula, saying, ‘Dad, something terrible (has) happened, Mitchel’s been in an accident, you need to come home. Construction of the second guard rail project begins this week and is scheduled to be completed in mid-October. 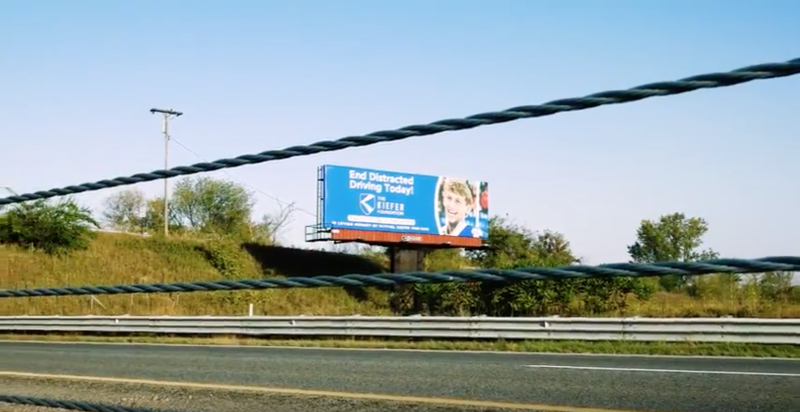 The Kiefer Foundation also established the Hands Free Driving Contest as a way to motivate young people to come up with inspiring messages to end distracted driving. The contest spanned June 21 to Sept. 3 during the “100 Deadliest Days” between Memorial Day and Labor Day when teen car crashes increase significantly. In addition, The Kiefer Foundation has partnered with B.R.A.K.E.S. to conduct a Teen Pro-Active Driving School, Sept. 28-30, on Belle Isle. The event is cosponsored by GM, Denso, Kia, and Penske Corp.
B.R.A.K.E.S Teen Pro-Active Driving School is a four-hour program that partners teens with professional driving instructors to teach the skills of defensive driving in a controlled, hands-on environment. Put On The B.R.A.K.E.S. (Be Responsible And Keep Everyone Safe) is a non-profit 501(c)3 founded by NHRA drag racing star Doug Herbert after the loss of his sons, Jon and James, in a tragic car accident. The Kiefer Foundation has partnered with PEERs to bring its augmented reality distracted driver simulator to schools, events, and corporate facilities around the country to demonstrate the dangers of distracted driving in a safe, interactive manner. PEERs has educated more than 20,000 people since the inception of its partnership with The Kiefer Foundation. The PEERs Foundation is a 501(c)(3) non-profit organization that seeks to empower young people with the knowledge necessary to building healthy, successful lives by using innovative and interactive learning interventions.